Messenger bag for a man. 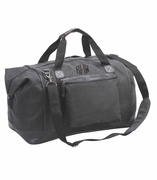 Whether you're traveling for business, to work in the city or on campus, this could be the perfect carry-all bag. 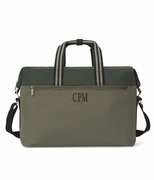 Weathered washed military green canvas material with brown faux leather front magnetic close buckles. Hand carry or use the adjustable thick canvas over the shoulder carry strap for a comfortable fit. Interior padded divider for tech products with velcro tab, two inside open wall pockets and one zipper compartment. Two outside easy access gusset pockets for cell phone, keys, ID etc also with magnetic tab. The bag design is large and spacious, perfect to hold all your day to day necessities and is also ideal for that weekend away trip. 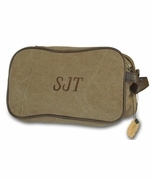 Add a monogram for a classic finish. Crossbody messenger tote bag measures 13.75" x 11.75" x 5" across bottom.